Lucy Chappell, third from left, won a bronze medal at the English Schools' Athletics Championships. 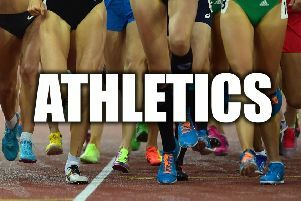 Doncaster Athletic Club’s Lucy Chappell celebrated her final English Schools’ Athletics Championships at Gateshead with a medal. Former Ridgewood School pupil Chappell, who also had the honour of carrying the South Yorkshire flag, picked up a bronze medal after clearing a height of 1.72m in the senior girls’ high jump. She said: “I am so pleased with how I performed. “I knew that I was in great shape but I also knew it was going to be a tough because all five of the girls in the competition jump around the same height. Clubmate Joe McGrath, second in his heat in both the first round and semi-final, finished fifth in the senior boys’ 100m final in a wind-affected time of 11.08 seconds. Emily Jones, fifth in her heat in a time of 26.29 seconds, failed to progress in the senior girls’ 200m. Sophie Mills competed in the intermediate girls’ 200m and came sixth in her heat in a time of 26.98. Mollie Magee-Sharpe finished well down the field in the inter-girls’ shot.